But first, we need to touch on some disappointing news. Last time I wrote about SCLC treatment, the new drug ROVA-T was all the rage. It was reported then that, in a clinical trial, 68% of SCLC patients who relapsed after the first line of chemotherapy and whose tumors expressed the protein DLL3 (the target of ROVA-T) had a response—a remarkable number for relapsed SCLC. Eighteen percent of those patients had tumor shrinkage, and 50% had stable disease. However, the median progression-free survival (PFS) was 2.8 months, which even then did not sound too impressive. Well, things have soured since then. 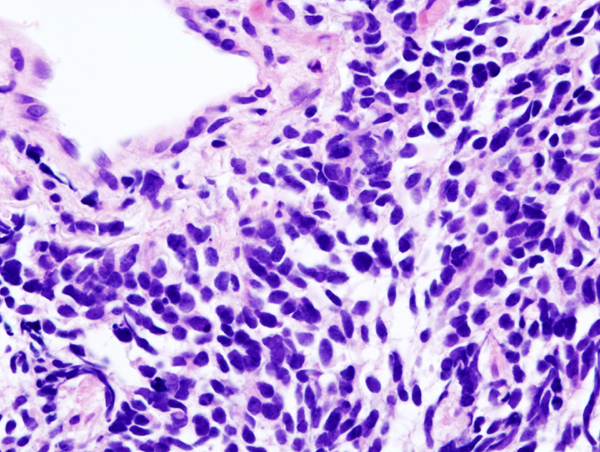 A phase 2 clinical trial evaluated the activity of ROVA-T in SCLC patients who relapsed after two lines of chemotherapy—a patient population that basically has no treatment options. The results were disappointing, and ROVA-T will not be pursued as a single agent for third-line treatment in SCLC. However, trials testing combinations of ROVA-T with immune checkpoint drugs (NCT03026166) and with chemotherapy (NCT03061812) in the second-line setting are ongoing. In more hopeful news, immune checkpoint drugs have now made further inroads as treatment for refractory SCLC. Since the first report of good results in 2016, more positive data have been published. Nivolumab (Opdivo), a drug that blocks the PD-1 protein, is now under priority review by the U.S. Food and Drug Administration (FDA) for patients with SCLC after one or more lines of chemotherapy have failed. The 2016 clinical trial report said that 33% of patients survived for at least 1 year when treated with nivolumab. The same trial (Checkmate-032) also explored treatment with a combination of nivolumab and ipilimumab (Yervoy; an immune checkpoint drug targeting the protein CTLA-4) at different doses. The response rate for patients who received the combination was higher than for those who received only nivolumab. This combination is already FDA-approved as second-line treatment for non-small cell lung cancer (NSCLC). Importantly, immune checkpoint drugs induce a much more durable response, with some patients experiencing progression-free survival for 2 years. The combination of nivolumab and ipilimumab has been shown to have particularly high activity in SCLC patients whose tumors exhibit high tumor mutation burden (TMB)—the overall amount of mutations present in the DNA of a tumor. In these patients the 1-year overall survival rate was 62%, much higher than in patients with low or medium TMB. Now, there is apparently a promising new development in combining immune checkpoint drugs with chemotherapy for SCLC. A phase 3 study called IMpower133 compared the combination of the anti-PD-L1 drug atezolizumab (Tecentriq) and chemotherapy (carboplatin and etoposide) to chemotherapy alone in newly diagnosed SCLC patients. The trial sponsor, Roche, reported that both PFS and overall survival were improved in patients receiving the combination, although details have yet to be released. In another clinical trial, a drug called lurbinectedin showed activity as a second-line treatment for patients with SCLC. Of the 61 patients treated with lurbinectedin, 24 (39.3%) had a partial response, and 40% had stable disease. The median PFS was 4.1 months, and patients survived for a median of 11.8 months (overall survival). Some progress has also been made in exploring the utility of drugs known as PARP inhibitors, which target cancer cells’ vulnerability in repairing DNA damage induced by many chemotherapy drugs. Results from a clinical trial that compared a combination of the PARP inhibitor veliparib and temozolomide (TMZ) to TMZ alone did not actually show an improvement in overall survival between the two treatments. However, the rate of responses in patients who received the combination was almost three times higher (39% versus 14%) than for TMZ alone. Perhaps more importantly, a new marker that could potentially predict a patient’s response to veliparib (and most likely to other PARP inhibitors) was discovered because the trial collected some biomarker data. Patients with high levels of the protein SLFN11 in their tumors had a significantly increased overall survival rate (12.5 months versus only 7.5 months in patients with low SLFN11). Hopefully, selection of patients most likely to benefit from PARP inhibitors could be incorporated into future trials with PARP inhibitors in SCLC. One could also envision combinations of PARP inhibitors with immune drugs in future trials to improve the duration of responses. Recent years have clearly seen some progress in improving treatment options for SCLC. One interesting point is that even though there are no targetable mutations in SCLC, there are emerging promising biomarkers of response to immune and targeted drugs.